During 1943 the U.S. Bureau of Aeronautics considered to combine the tasks of torpedo bomber and dive-bomber into one. Several aircraft manufacturers, such as Douglas and Martin, were requested to develop a large, single-seat attack aircraft. According to the requirement, Douglas Aircraft Company, Inc. The development was started in early July 1944, and all night efforts of engineers made the first prototype"s first flight possible already on March 18, 1945. Despite of the short period of the development, flight trials proved the airframe"s flight characteristics satisfactory and the aircraft was rated very highly. In May 1945 a letter of intent for 598 production was signed. 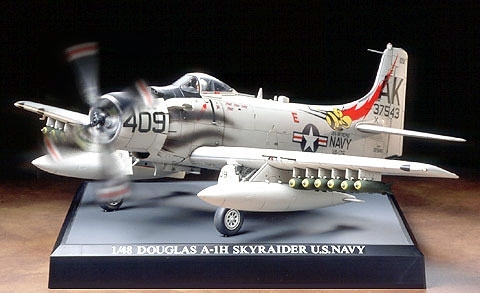 The name "Skyraider" was officially approved for the aircraft in February of the following year, and the distribution to units was started at the end of the same year. The Skyraider was powered by Wright R3350 radial engine yielding 2,800 horse power and equipped with three large dive brakes on the fuselage. The Skyraider had a number of types, from the AD-1 to AD-7, recording grand total number of production of more than 3,000. Among them, AD-6 was the most produced variant. The AD designation for the Skyraider was changed in 1962, and the AD-6 became the A-1H. Noted for its durability and a large capacity for external stores, the Skyraider was well liked by its pilots and crewman.